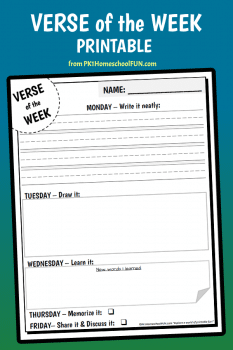 Make studying Scripture easy and fun with this printable Verse of the Week Printable from PK1 Homeschool Fun! What a great way to keep Bible study a daily activity! Each day of the week has a different task to help learn the verse such as handwriting, drawing, discussions, and more! With these small and simple tasks, kids will learn to study Scripture in a way that is not overwhelming for them, and each day will reinforce the verse and the lesson! Grab this Verse of the Week Printable here!